For an additional 20%, we can add a beautiful bronze powder coat finish. Whether you’re just beginning your journey or you’re a seasoned home gardener, SB Greenhouses is here to help you take your growing to the next level and experience the joy of growing bountiful crops right from your own backyard. We’ve been building beautiful, high-quality greenhouses for nearly half a century, and we work with each customer on an individual basis to help them choose the ideal greenhouse for their unique needs and situation. If you’re interested in owning your own aluminum greenhouse, we encourage you to call us at 800.544.5276, reach out to us at our contact page, or request one of our product catalogs completely free of charge. For an overview of our Montecito aluminum greenhouse pricing and sizes, just check out the table below. We hope to hear from you soon, and we’re excited to help you realize the rewarding passion of home gardening! In addition to our discount, if you order now we will even pay for all shipping charges for you. This could mean saving of up to $2500.00 or more. Call now at 800-544-5276 to place your order, or if you would like us to send you a catalog first. Also, take 25% off bronze powder coat charge. At SB Greenhouses, we’re passionate about backyard gardening. That’s why we’ve created a wide-ranging line of some of the highest quality home greenhouses in the market, offering affordable greenhouse kits for gardeners at every level and in almost any climate. We’ve been creating beautiful, durable, and highly effective greenhouses for more than 44 years, and every greenhouse we make is created in our American factory so you can be sure you’re getting the quality of something “Made in the USA.” If you’re looking for a durable, rugged greenhouse for your own backyard, our Montecito Aluminum Greenhouse Kits are hard to beat. Compare our ruggedized, heavy-duty, exclusive “Insalume” frame with any other, and we think you’ll find one thing immediately true: there’s simply no comparison. Our 8mm Double Wall Polycarbonate panels slip easily into pre-cut channels in the frame, creating three full dead air spaces for unbeatable insulation. Our full 6ft vertical side walls provide 30% more growing space than dome or slanted wall greenhouses, and our frames are bolted together using 16-gauge steel plates, creating one of the strongest aluminum greenhouses on the market. Plus, everything is pre-cut and pre-drilled in our factory, making assembly a breeze. Just slip the panels into the frame, bolt the steel plates in place, and you’ll be growing bountiful harvests even in the dead of winter! Few aluminum greenhouses can provide the level of insulation and weather-resistance of our Montecito Aluminum Greenhouse Kit. Imagine stepping into your own “Montecito” greenhouse on a cold winter day and suddenly feeling like you’ve stepped into the warm, pleasant air of tropical Hawaii. Smell plumeria, pick fresh, home-grown organic vegetables, or tend to beautiful, blooming orchids that you can take into your home. 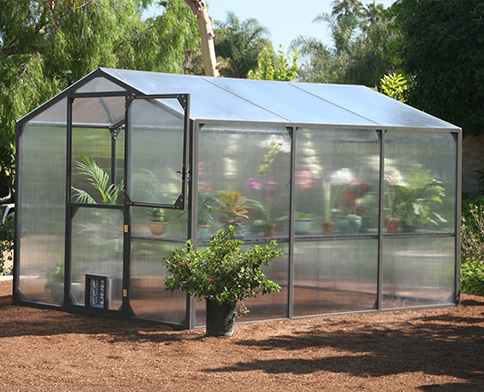 With a DIY aluminum greenhouse from SB Greenhouses, you can grow your own slice of paradise right in the comfort of your own backyard!